Want a Unique Dinning Experience and Get an Education at the Same Time ? 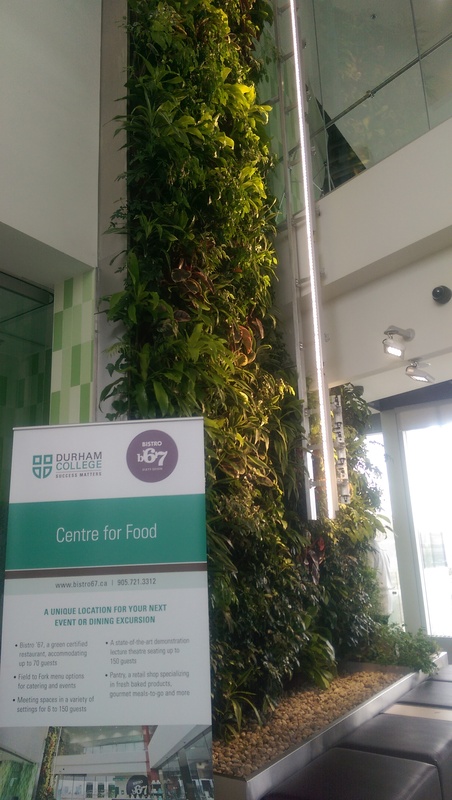 Last week I had the privilege of attending our local Realtors Commercial meeting and Instead of the typical and boring meeting room or conference centre, our meeting was held at the CFF at Durham College or the Centre For Food. The CFF features an absolutely fantastic Dining Environment and Experience called Bistro 67 or B67. This is not only a unique Bistro or Dining experience its home to the new concept being introduced to local college students called the Food to Fork program. I was blown away by the entire experience and more so by the tour of the complete facility located right here in Durham Region at the Whitby Campus. I cannot encapsulate my experience as well as they do on their own website so I looked to the Durham College website for additional information to help tell the story. The Centre for Food (CFF) follows the field-to-fork concept, which is based on the harvesting, storage, processing, packaging, sale and consumption of food – in particular the production of local food for local consumers. Durham College has adopted this concept and applied it to a diverse range of programs that crossover traditional academic schools with the curriculum, faculty expertise and equipment required to implement field to fork built into several of the college’s programs. This incredible new learning centre features Bistro ’67, a full-service, green-certified teaching restaurant and lounge, and Pantry, a unique retail food store offering a delicious assortment of foods prepared by students. Development on the CFF is continually underway including extensive landscaping planning for the grounds surrounding the building. This includes plans for a future on-campus orchard, pollinator garden, greenhouse, demonstrator gardens, agricultural planting zone and arboretum.